In my college days, I was really into the collectible card game Magic: The Gathering, although in the last decade or two I don’t think I’ve played a single game. One of the fun things about having children is the possibility of exposing your hobbies and interests to them, and if you are lucky they will catch on and you can enjoy those things together. Of course, there are some things that are not age-appropriate, either because of improper content or difficulty. So for awhile I have been biding my time, trying to figure out when I can pull out my binders of M:tG cards and have some exciting duels. One of the things about teaching a card game to my son is that we generally speak in Japanese at home, so at minimum I wanted to learn the proper terms for the game in Japanese so we didn’t have to switch to English just for M:tG. That was one of the motivations for creating this vocabulary list about Japanese words for playing board and card games. But even if we knew how to talk about the game in Japanese, there was the fact that all my cards were in English, so we would have to switch to English pronunciation for the card names, or use romaji-style pronunciation for them––neither of which sounded too appealing to me. While I could buy all new cards in Japanese, not being able to use my old English cards would be pretty frustrating. And I think my son is still too young to truly appreciate M:tG anyway (I’ve heard the minimum for that game is around 10 years old). So I went on a search for a similar card game that is easier and available in Japanese, and after reading the title of this article I’m sure you already know where this is going: the Pokemon card game. While I haven’t played it before, based on my research it seemed that my son is right around the lower end of the age range for this game. Just around a week ago I decided to order a starter set of the latest Pokemon card series, “Sun & Moon”. I was lucky to find a Japanese version of this on the regular (US) Amazon site bundled with a few expansion packs. I didn’t do the math but it seemed like the shipping (compared to buying in Japan) wasn’t too excessive, although if I ever have a need to buy a lot of Japanese cards doing that personally in Japan would surely be cheaper. While I was waiting for the cards to arrive, I spent some time trying to learn how the basic rules of the game work. I found these two videos in Japanese which summarized the basics well (although they are far from comprehensive). Even if your Japanese listening skills aren’t that great, these videos have enough visuals and subtitles to aid in understanding. Despite the similarities, there are also many differences from Magic: The Gathering (for example, you only have one active creature in play, and when it is not your turn you cannot perform any actions), but I think anyone who knows M:tG well can pick up Pokemon Cards without too much trouble. When the package arrived, me and my son opened it up with excitement, but I was a little disappointed that there was no “tutorial” which I had expected, having heard from someone that the Sun & Moon starter contains a tutorial describing things step-by-step with two small premade decks (I guess this is only for the English version). Also, while the 60-some cards in the starter set were organized into two piles of 30 cards each, these didn’t seem to be playable half-decks; for one thing, one of the piles had most of the energy. So I had to make my own pair of half-decks (with very limited knowledge) before we could even start playing. Pokemon cards generally use 60 card decks but half-decks of 30 cards each are also possible, though the suggested ratio of card types as well as a few other things change. Having not opened the expansion packs yet, the only way we could play a 2-player game was to make two half-decks of 30 cards each. The starter set came with a bunch of paper damage counters (ダメカン), a plastic coin, and a foldable playing mat. The mat had different areas to place the decks, used cards, active pokemons, etc. but for some reason the names of these areas were all in English. I didn’t think too much of it at the time, except that maybe they were trying to expose Japanese children to more English. I still didn’t feel very comfortable playing a real game just based on what we learned from those two videos, so I started reading through the manual. It was pretty long, so I just focused on the parts related to setup and basic turn mechanics. I wanted to mention one interesting cultural observation about the steps to play as described in the manual. The very first step is for each player to shake hands and say to each other “よろしくお願いします” (yoroshiku onegaishimasu). This is one of the trickier phrases in Japanese that is very commonly used in different situations and hard to translate, but in this case I am fairly sure it just expresses that you will respect your partner and play fairly. This same phrase was used to begin class in the first-grade elementary class I visited in Japan recently, which I reported on in detail here. The next step was to decide who goes first; this too was done in a very Japanese way: rock, paper, and scissors (グーチョキパー). After a bit of stumbling, we managed to play one game with our two half-decks in around an hour, though I had a bunch of questions about the rules; some of these were answered by skimming through the manual again. My initial feeling about the game was that it was more complex than I expected, especially considering some people said 6-year-olds could play it––though to be fair that was the bare minimum, the average is probably more like 8 or 10 years old. While the basic flow and objective of the game are pretty simple, there is a bunch of status effects and many of the cards have unique abilities; it is not uncommon for a card to have two or three unique special abilities. From the perspective of someone who is learning Pokemon Cards partly as an exercise to practice Japanese reading skills, I felt it was worthwhile exercise. Not just because I learned a few new words, but because I think there is great value in reading something that you actually must *use*, as opposed to just understanding in a vague sense without any real application (ex: reading a novel). There are actually consequences to making mistakes, and a few times I misunderstood something, but when I saw things not matching up I eventually corrected my misunderstanding. 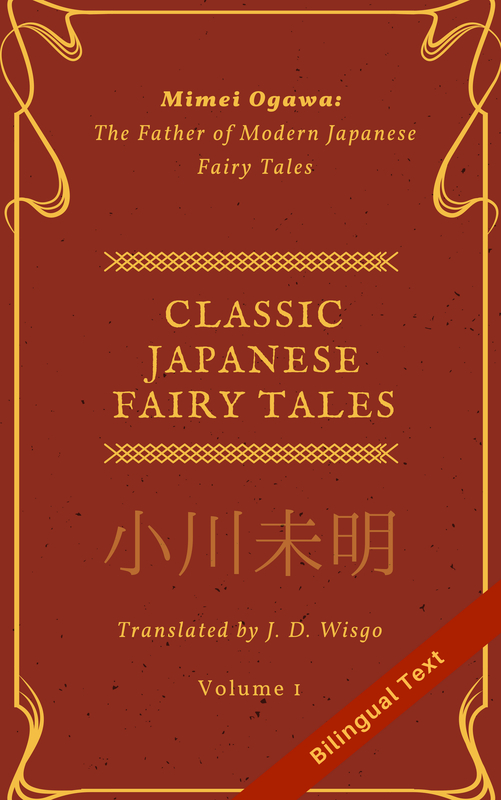 A majority of the words use furigana so you don’t have to know hundreds of kanji, though it helps. I actually had the opposite problem, since many of the attack (わざ, which is literally closer to “technique”) names are written in hiragana only, like こうそくいどう. For this example I happened to know the words making up this compound word (I think it’s from 高速移動), but in other cases it was less clear. By far the biggest challenge I had was the size and readability of the text on the cards. The title and attack names are is a reasonable font size, but the descriptions for the attacks are uncomfortably small. To make things worse, some the more powerful cards have a beautiful shiny/iridescent effect to them (called キラカード in Japanese), but that shininess makes it frustratingly hard to read the already small font. There is even some text at the very bottom of cards that is even smaller. In one case, there was something very important written there which I didn’t realize until I had played a few games. Another problematic area is the furigana (reading hints in hiragana above kanji) which is super tiny and really hard to read. These generally weren’t that bad for me since I knew the kanji already, but reading them was a challenge for my son. Some of the words or phrases are the same on every card (like にげる) that you can get used to quickly, but much of the text varies by card. Nevertheless, by looking at the cards under a bright light we are still generally able to make out the text. While I was able to manage reading the cards for the first time in the middle of a game, if you are less confident with your reading level (due to your reading speed, the size of your lexicon, or other things) I recommend taking your time and reading slowly through each card once before you actually attempt a game. To make reading and looking up unfamiliar words easier, you can get all the information about each card in Japanese using a site like this. (By the way, playing around on that site answered a curiosity I had about the number of total cards in the game: it’s 8961). Also, if you and/or the person you are playing with are new to the game, you don’t need to actually use all of the cards or attacks with the longer or more complex descriptions. You can stick to the simplest aspects of the game and then add in more elements as you get familiar with the basic flow and actions. At this point, my son and I have played around 15 games and are starting to get the hang of things, but our decks seem somewhat badly built; it feels that victory is more likely due to a lucky draw than good tactics (some of this is probably because we playing with half-decks, though). But I think the more we play (and rebuild our decks with more cards), tactics will start to matter more. I’m also planning on watching some more videos on Youtube about Pokemon cards in Japanese. By the way, a few days after we had been playing, I realized the playing mat written in English was actually two-sided, and the other side had everything in Japanese, plus a convenient set of rules and helpful hints (I wonder why that was not on the English side). Discovering this earlier would have saved a few trips to the manual. But before I purchase any more cards I want to make sure I have confidence my son will keep interest for long enough. He is into it now, but it’s more for the cool-looking cards and basic attack/win enjoyment. He’s still a long way from understanding proper deck building and strategy (and, to be frank, as am I). But I do see Pokemon cards making him exercise two skills I was hoping would be: arithmetic, and––to a lesser degree––reading. To facilitate this, I try to frequently ask him how much HP a pokemon has left after getting damaged, and to read the card names when they are played. For the longer text descriptions, I’ll usually read them to him, at least for the time being. There are probably some parents who hesitate to get their kids hooked on collectible card games like this, especially because “collectible” often means “the more money you spend the better cards you can get”, and I definitely spent my share of money on M:tG in my college days. But, if done correctly, I think games like this can be used as a lesson for how to save and spend money properly, a forum to learn morals about winning and losing, and as a way to practice reading and math; it also creates more face-to-face social opportunities, as opposed to just sitting and playing games on a tablet. Card and board games are a good hybrid between computer games and the “real world” that I think shouldn’t be overlooked, especially for those trying to minimize screen time. If I decide to take the plunge and buy more cards, I have one more difficult decision ahead of me: to keep with Japanese cards or switch to English. While going English seems against my initial decision to buy Japanese cards, I realized that the game will be much more fun and rewarding if we can get out there and play with real people––and of course in the US most people will have cards printed in English. While playing people who are very familiar with Pokemon might be OK with us playing with Japanese cards (assuming they already know what the cards say), surely many people would be against it, and I don’t want to cause conflict from the get-go. There’s also the text readability problem, and even if I buy English cards we can use them at home mixed with Japanese cards without any major issues. But whichever language I go, I still need to figure out what series(s) would be best to buy; do I stay with Sun & Moon until I have all the mechanics figured out, or branch off into some older series? I know this is a subjective question, but if there are any experienced Pokemon card players out there, feel free to chime in. On a final note, while the vocab list I mentioned above has some of the words needed to learn Pokemon cards in Japanese, there are still a bunch of common terms missing from that. If you feel you could benefit from a more specialized vocabulary list for Japanese words used in Pokemon cards, let me know and if I get enough interest I may generate one. 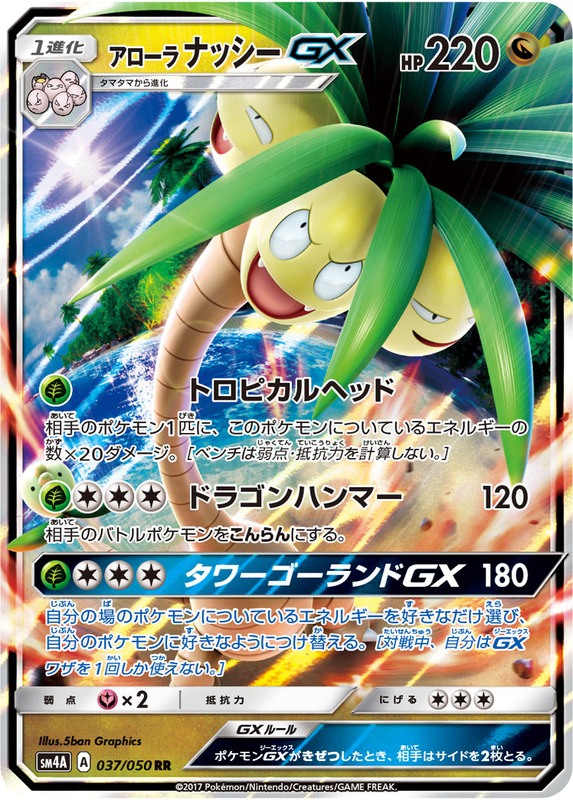 Below: one of the better cards I got in my expansion packs was Alolan Exeggutor GX (アローラナッシー GX ). See if you can read the important text in the bottom right which took me some time to realize. This highlights one more interesting thing about the cards, which is that sometimes there are major differences between the Japanese and English names. I’ll have to admit “Exeggutor” sounds much better than “Nassy”. Even in Japanese “Nassy” sounds weird––it reminds me of the oddly-designed yuru-character “Funasshi”. I actually own some earlier Pokemon memorabilia from the nineties that did translate 技 directly as “Technique” instead of the now standard “Move”, such as the “Official Pokemon Handbook”. I think “technique” is a more accurate translation, but young kinds may not know that word, so the more modern/casual “move” makes sense.